Hachette Book Group is asking Amazon.com why it's taking so long to deliver books by Stephen Colbert and others. The delivery of popular books from Stephen Colbert, Malcolm Gladwell and others is being delayed by Amazon.com, and publisher Hachette Book Group wants to know why. Hachette said it's getting pressure from its own customers for answers. "We have been asked legitimate questions about why many of our books are at present marked out of stock with relatively long estimated shipping times on the Amazon website," Hachette said in a statement to CNNMoney. The book publisher said the titles are available immediately from other websites and in stores. Hachette said that, "for reasons of their own," Amazon is holding minimal stock and restocking some of its books slowly, causing "available in 2-4 weeks" messages to appear when customers try to order. CNNMoney checked the Amazon.com (AMZN) website and confirmed that on the transaction page for Gladwell's book "Outliers," there is a message from Amazon saying "Usually ships within 2 to 3 weeks." 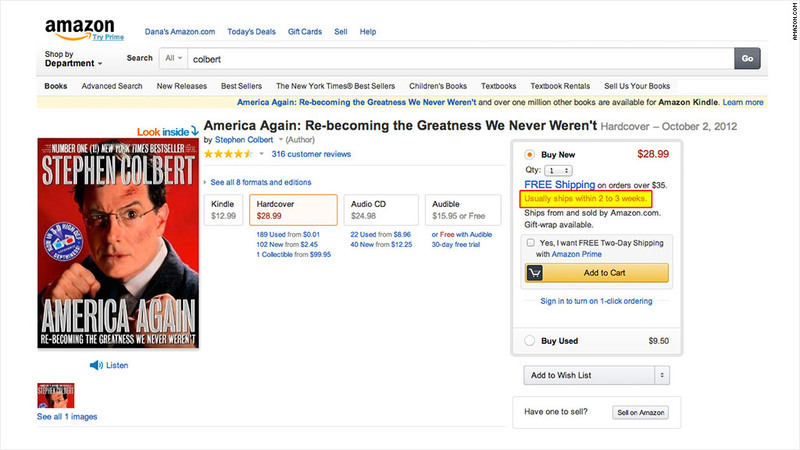 The same message was on the Amazon.com page to purchase Colbert's book "America Again: Re-becoming the Greatness We Never Weren't." The New York Times pointed to speculation that Amazon may be trying to squeeze more discounts out of Hachette and the delivery delays could be a tactic to pressure Hachette. Neither Hachette nor Amazon.com would comment on that claim.